A late Ian Keatley penalty consigned Edinburgh to a third straight Pro12 defeat at home to Munster. Alan Solomons' side had scored a wonderful try through centre Will Helu after Munster had started strongly with a John Ryan score. Sam Hidalgo-Clyne kicked three penalties with a host of returning World Cup internationals on both teams. But the scrum-half saw his dramatic drop-goal attempt charged down three minutes into overtime. With just three minutes gone, Ryan muscled between Edinburgh's centres to ground the ball against the base of the post, Keatley converting. Hidalgo-Clyne replied with a penalty and Munster's Gerhard van den Heever was sin-binned for colliding with the airborne Tom Brown, but Edinburgh - supreme in the scrummage and wayward come the lineout - failed to capitalise significantly on the winger's absence. Keith Earls came within a whisker of a second try, haring after a sumptuous Conor Murray box kick deep into the Edinburgh 22, but spilling the bouncing ball at the corner flag as the cover defence heaved him out of play. Keatley thumped over a penalty from just inside Edinburgh's half after the home pack shunted a fraction too early in the scrum and Hidalgo-Clyne slotted his second three-pointer to bring the hosts back within four points at the break. 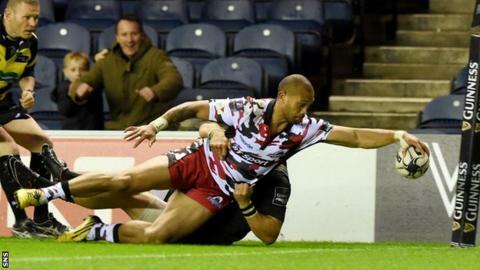 Under Solomons, Edinburgh have relied more upon a pulverising pack than abandon out wide, but the try they crafted shortly after half-time was a work of some beauty. It started with Cornell du Preez, the back-row, fielding a kick in his own half and releasing Damien Hoyland down the wing with a delightful offload. Youngster Hoyland danced and shimmied his way through the Munster defenders, before the ball was swept to the other flank via Hamish Watson and Tom Brown to find Helu, who raced for the corner and grounded powerfully. Hidalgo-Clyne's conversion attempt ricocheted back off the upright. Keatley then hooked a penalty effort wide from distance and Munster lost a second man to the flash of David Wilkinson's yellow card, All Black centre Francis Saili binned as he was caught on the wrong side of a ruck. Hidalgo-Clyne converted the resulting penalty, but Munster's pivot cancelled it out with one of his own five minutes later. There is little doubt Edinburgh are on an upward trajectory, but there are still rough edges, notably in the fluidity of the backline play, to be refined - the number of infuriating fumbled passes will have more than irked Solomons. From one such vexing spill, replacement prop John Andress brought a scrum crashing to ground and Keatley regained Munster's lead with a huge kick from the tee. The visitors turned the screw. Keatley arrowed the ball in behind Brown and the Irish pack lay siege to Edinburgh's line, yielding a yellow card for the hosts' fly-half Greig Tonks. Edinburgh rallied well, though, resisting Munster's advances, and with the clock almost red, Hoyland intercepted in his own 22 to race downfield and set up a heart-stopping, but ultimately fruitless, finale. Edinburgh: Blair Kinghorn, Damien Hoyland, Will Helu, Matt Scott, Tom Brown, Greig Tonks, Sam Hidalgo-Clyne; Alasdair Dickinson, Ross Ford, WP Nel, Anton Bresler, Alex Toolis, Mike Coman (captain), Hamish Watson, Cornell Du Preez. Replacements: Neil Cochrane, Rory Sutherland, John Andress, Roddy Grant, Nasi Manu, Sean Kennedy, Andries Strauss, Dougie Fife. Munster: Simon Zebo, Gerhard van den Heever, Keith Earls, Francis Saili, Ronan O'Mahony, Ian Keatley, Conor Murray; Dave Kilcoyne, Duncan Casey, John Ryan, Donnacha Ryan, Dave Foley, Dave O'Callaghan, Jack O'Donoghue, CJ Stander (captain). Replacements: Niall Scannell, James Cronin, Mario Sagario, Robin Copeland, Jordan Coghlan, Tomás O'Leary, Rory Scannell, Denis Hurley.